Despite my love (and obsession) for blogging, baking, and modelling with sugar paste, I’ve recently come to the realisation that I want to teach. Not in the school teacher kind of way, but to teach people about food, baking, and everything I love and am so passionate about. There are so many misconceptions about baking. That its difficult and so not worth the effort. But once you’ve got the basic understanding down you can pretty much do anything, depending on how passionate (or obsessed) you are. I’m so fortunate that my Boss, A, feels the same way. She’s always had a dream to one day open a chef’s school. And so we’re beginning that journey now. Step by little step. We’ve started running short food enthusiast courses, focussed on desserts, baking, and brunch ideas. We’re also going to be running an intensive cake decorating workshop during July/August. So much planning but so much fun to. So if you live in South Africa, near Cape Town, you’ll be happy to know we’ll be going full steam from the beginning of July! If you’re interested leave me a comment and I’ll provide you with the info. In our evening workshop on Wednesday night we made, amongst other things, apple crumble. 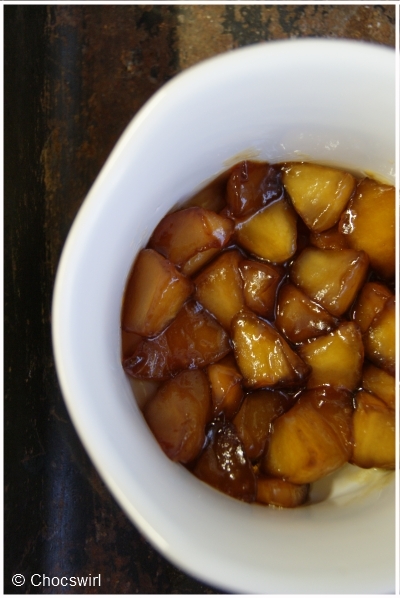 I never realised that apple compote can be so darn yummy! I had a moment. Right there in the middle of a room full of busy, rowdy, messy, adults. I was whisked away to taste utopia. I decided then, that I needed to make it again, and soon. I just didn’t know if I felt like making exactly the same apple crumble. While chatting to A about dessert ideas for the course the next day it hit me. What’s my (other) favorite dessert? 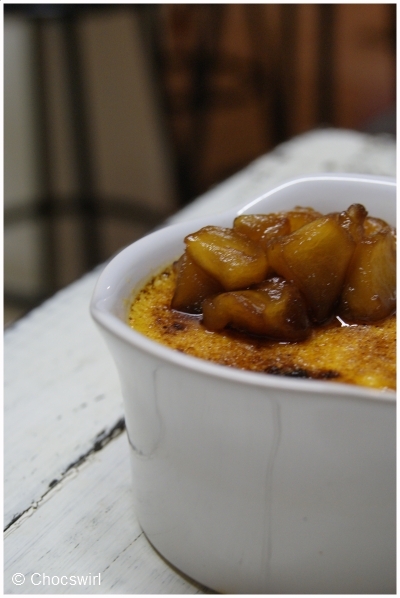 Crème Brûlée. And so it was born. 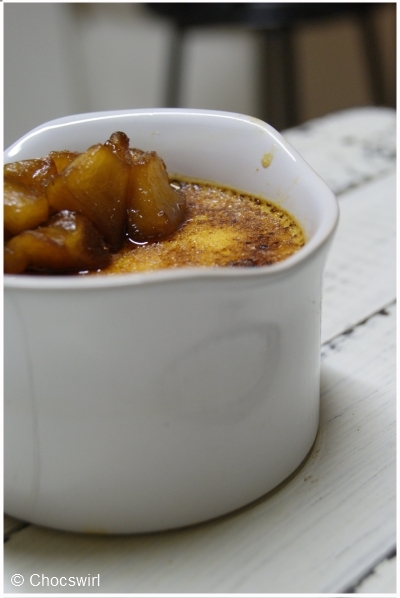 Apple Brandy Crème Brûlée. It is truly one of my favorite desserts so far, and was made better by the fact that I hardly used the recipe and just threw things in as I went. Its a good feeling when you can see your sense of taste developing and when you realise you can trust it. It is a really easy dessert to make. 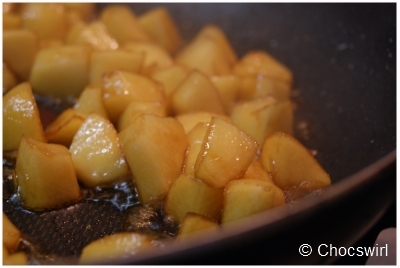 Fry the apples in the butter for a few minutes. Add the brown sugar, brandy, lemon juice and vanilla and stir well to mix and let the sugar dissolve. Cook, stirring occasionally, for about 5-10 min until the apples are soft. If the mixture gets too dry in the pan, add some water and cook some more. Then remove from the heat and set aside to cool. Preheat the oven to 130°C and get a baking pan ready with 4-6 ramekins inside. (to make a baine marie) Heat the cream with the vanilla and brandy in a medium saucepan over medium heat until just starting to simmer. Meanwhile, mix the yolks and sugar together in a separate bowl. 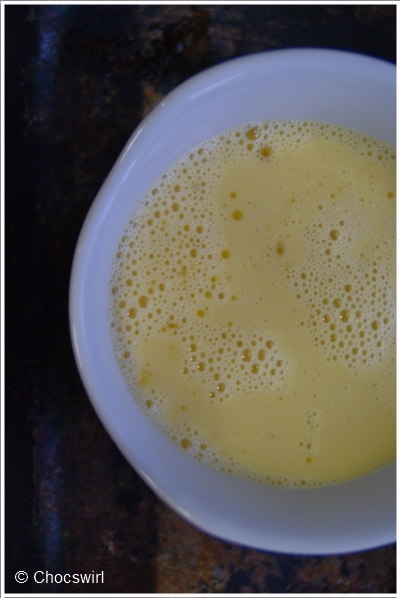 Remove the cream from the heat and slowly pour it into the egg yolks, stirring continuously. Place a layer of apple compote in the bottom of each of the ramekins, then pour the mixture in on top and fill the baking pan with water until half way up the side of the ramekins. Bake for about 45 min, or until they wobble like jelly when you gently shake the pan. (if they wobble like a liquid then they’re not ready yet) Remove from the oven and let stand for a few minutes in the pan. Remove from the pan and let cool to room temperature before placing them in the fridge to chill and firm up. Remove them from the fridge 20 minutes before serving and just before serving, sprinkle a layer of castor sugar on top of each and use a blow torch to caramelise the tops. Thanks Col! :) Means alot coming from you! Please send me the info about the cake decorating course, I am very interested in attending! This was a truly yummy dessert. Take my word for it. I was there and it was made in my kitchen. Thanks R. Truly inspiring! thanks mom! :) It was a yummy experience! Sounds fabulous, looks wonderful- definitely going to give this one a try – will let you know how it goes!